The new Windows 8 and its phone counter-part Windows Phone 8 along with the flagship devices like the Microsoft Surface clearly rely a lot on celebrity endorsement. Microsoft has kicked off an ad campaign with Jessica Alba and Gwen Stefani for the phones, and now Oprah is praising the Microsoft Surface in any way she can. She has tweeted about it saying: “Gotta say love that SURFACE! Have bought 12 already for Christmas gifts. #FavoriteThings” You’d assume she loves it and uses it all the time, right? Well, she might like it, but she is clearly not using it. That very tweet actually came from an iPad. And it’s pretty obvious as the tweet itself was sent via Twitter for iPad. Whoops, that’s weird. Chances are it is not Oprah herself tweeting all the time, but rather someone from her staff that messed this up. And she might still like it. But this does not ultimately matter. The endorsement message seems pretty much lost on us. because the surface might have a steep learning curve she won't have much time to master the gestures. LOL, what she means is she bought the Surface b-c she has used the iPad and knows how bad it is. But she'll use the Surface as gift only all 12 of them, and she will buy herself a Nexus 10.
all of a sudden you manage to insert nexus in this kind of talk. Wow, gotta admire you dude. You're so lost in your very own world. He does that n every article. It could b about tennis balls, and he'd insert nexus. He forgot people have the same choices he does, and not everyone wants a nexus. 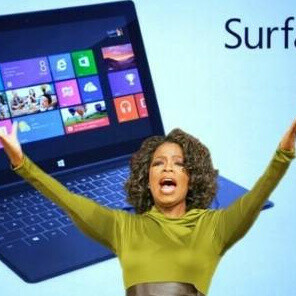 It's actually quite simple and I don't understand why people can't infer the obvious meaning of her action ..... Oprah simply did a "show and tell" for her disciples: "My dear followers, I am replacing my limited usefulness iPad and here I introduce to the World the tablet that I am replacing it with; join me in replacing Apple." nahh.... she f**ked up... its that simple..
Learning to use w8 in general is that hard? Wonder how people going to survive Dec 2012? She's like voting for Romney sitting beside Obama!! clowns voting for clowns, the orator vs the Mormon. So many smart, good, people out there yet there's only these two. Why? People why? Why haven't you learned your lesson. actually there were 21, not 2. the media never made this known since GE owns msnbc(the GE president is the current job Czar) and we all should know about fox and CNN. But i digress, anyone who get windows 8 is insane. It's like it was nerfed. Vista and 7 were already bad but this is taking it to another level. Dude!!! Who says Windows 7 is bad??? I think you don't know the meaning of improvements!! Windows 7 is way too heavy on resources. Yes it was a big improvement over Vista, which was extremely resource heavy but it it's still pretty bad if you dont turn off the aero. Sorry but to me XP was the best they did. windows 8 doesn't have twitter client yet. Sure it does. It's called twitter.com on IE10. Because the website lets you do most (if not all) the things the BASIC apps let you do! yeah. i must say its a much better experience on an app than on a website for most people. since i have got an ipad, i have never thought of twitter.com, not even on my pc. i simply use the app. There are like 4 Twitter apps in the marketplace. All very good. And just think, Microsoft only had the three years or so it's been working on the Surface RT to plan it!? or it just goes to show the pea brain IQ of celebs! Just like that celebrity (don't remember who) promoting Samsung Galaxy line in summer this year at Olympics - by taking pictures with her iPhone on the side. This is obviously an epidemic and shows how powerful Apple truly is. What was so confusing in the fact that Apple is so much in the genes of our culture that their devices pop out everywhere even if it's about promoting the competition? Of course Apple doesn't need marketing at all, everybody is doing it for them for free, even the competiton. She represents competiton. They pay milions to have Oprah represent them, and they still fail. Samsung gave out a lot of GS3s to the athletes at the olympics, and a lot of folks kept their owned devices as they were used to them. It isn't like they signed an exclusivity deal with them. There was also an athlete using an ipad as a camera while walking, so obviously not the best people to talk to about tech. Anything for publicity. Actually, Samsung, as a golden sponsor of London Olympics, tried to condition that everyone on air on Olympics show only their Samsung devices. Samsung gave thousands of Galaxy Note devices to everyone involved in organization of Olympics, to all celebrities and all sportsmen, and gave out the order to show only Galaxy Note on promotions. This failed numerous times, as celebrities were still using their iPhones and iPads. Even in first opening ceremony with USA team, Tyson gay took pictures with his iPhone in front of official cameras, and then Kate Upton showed Up on Samsungs promotion with her iPhone. They are paid to show Samsung, yet they fail to do that, just like Oprah, because Apple devices are important part of their lives, it like asking to hide your right hand in front of cameras if you are sponsor of technology for left-handed.